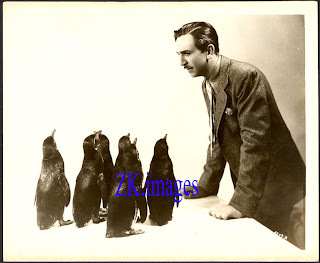 I am in London next Monday to Wednesday, then in California until October 4th to attend some of the events surrounding the opening of the Walt Disney Family Museum. See you all on October 5th and a few of you sooner, face to face. 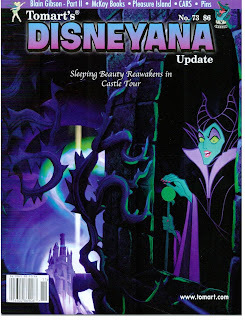 I have just received issues 72 and 73 of the Tomart's Disneyana Update. You should not miss those. 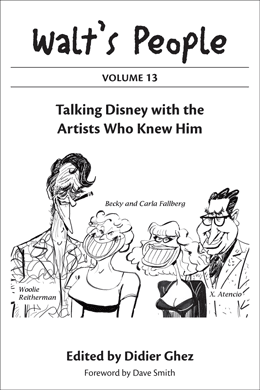 They contain a great interview with Blaine Gibson and the first two parts of a three-part in-depth article by David Gerstein about the Mickey Mouse Annual. Real treats. Some of you might be interested in this upcoming auction that will take place in Paris on October 10. Details in English at this link. 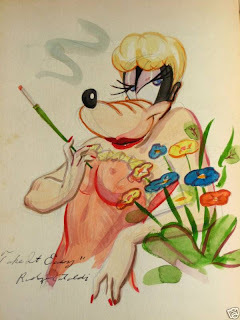 [Marvel Legendary artist Jack Kirby’s interpretation of Mickey Mouse. No time to update the blog today, unfortunately. 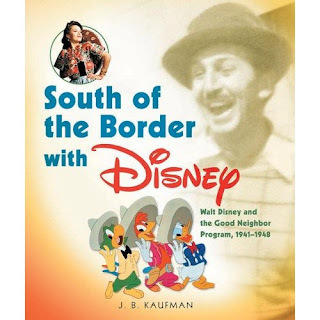 I have almost finished reading JB Kaufman's upcoming book South of the Border with Disney: Walt Disney and the Good Neighbor Program 1941-1948 and do not have enough words to praise it as it deserves. 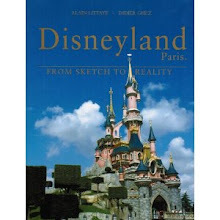 There is more fascinating research packed in this book that I could have imagined when I browsed through it a few days ago and every single visual document is carefully selected to both support the text and delight serious Disney historians. 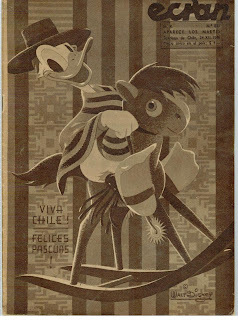 The Latin American theme inspired me to scan this rare magazine cover from Chile. I have a feeling that it might have been created by Hank Porter. There is something weird happening here however. This cover on which one can read "Long Live Chile! Happy Easter!" 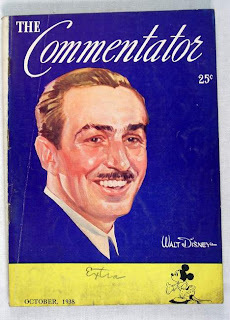 was released on a magazine dated December 24, 1945. I will have to check this evening if there is s story behind this strange situation. 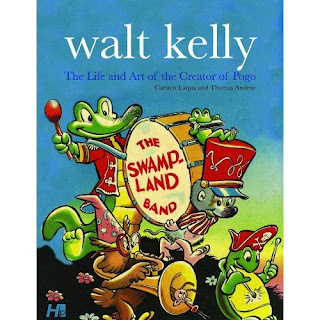 Not sure how much the upcoming book The Life And Times Of Walt Kelly by Thomas Andrae and Carsten Laqua will contain about Kelly's career at Disney, but this book has already made it to my Amazon.com's wish list as I respect the work of both Andrae and Laqua (and just re-read this weekend Andrae's interview of Kimball about Kelly, which I suspect will be reprinted in this volume). 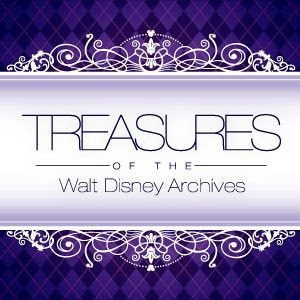 Do not miss today the full coverage of the D23 Expo on Disney and More (above is the cover of the Limited Edition catalog of the Treasures of the Disney Archives exhibition). Thanks to Jérémie Noyer for having spotted these three photos on ebay. I knew some of them, not all. 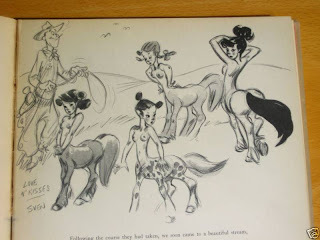 Someone is selling on ebay a copy of the 1940 Fantasia book by Deems Taylor autographed to Sally Holmes by a huge number of Disney artists. 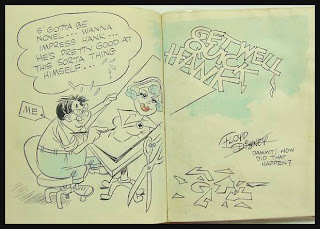 Despite some hillarious claims (the seller believes that one of the drawings was created by Dave Disney - the confirmed nickname of Walt (!!) 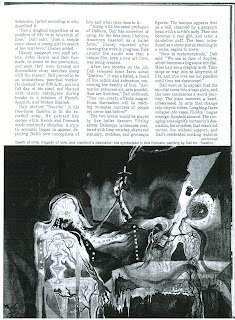 - when the drawing is in fact by Dave Detiege) the quality of this piece is truly exceptional. You can see more drawings at this link. Who was Sally Holmes, by the way? 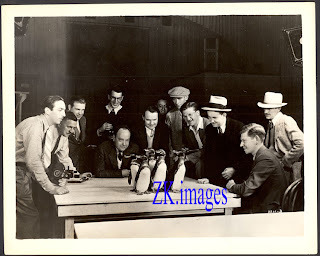 Are Myklebust was kind enough to send me recently this great photo from 1942 of Walt with Sergei Rachmaninoff (Russian composer, 1873 - 1943) and Vladimir Horowitz (Russian classical pianist, 1903 – 1989). 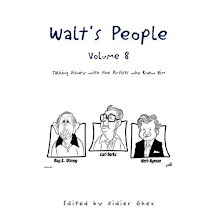 I am hard at work on the volumes 9 and 10 of Walt's People. 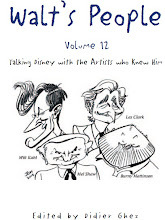 Volume 10 will be fully dedicated to the interviews conducted by Bob Thomas. 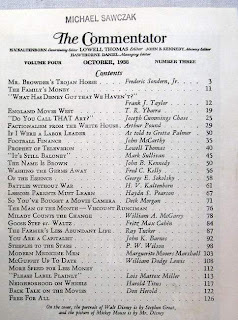 You will find below the list of all the Bob Thomas interviews I could locate. I know I am still missing some. Those I am missing are not stored at the Walt Disney Archives or at UCLA. 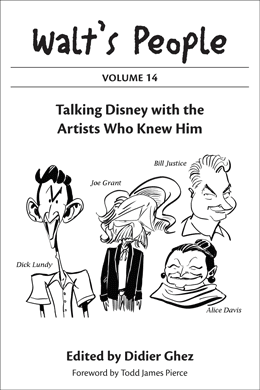 I am especially looking forward to locate the interviews with Rolly Crump and Harriet Burns that are mentioned in the bibliography of Jeff Kurtti's book Legends of Imagineering. Jeff not longer has access to those. 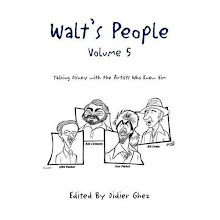 Great news: Walt's People - Volume 8 is now available on Amazon. 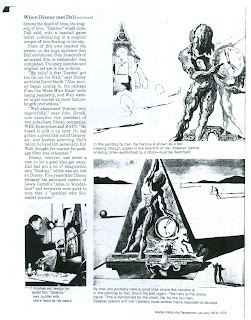 I think you will enjoy this article that Michael Crawford was recently able to track down for me. 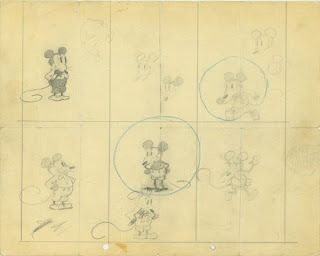 Along with a few other Disney historians, I am trying to launch a project to preserve in digital format some key Disney history related documents. What should be our scanning parameters? 300 dpi in jpeg? Or should the resolution be even higher for artwork, the file format different,...? and I updated the Disney Books Network this weekend. 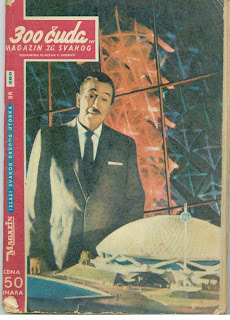 Some of you will enjoy this Serbian magazine cover from January 1966. 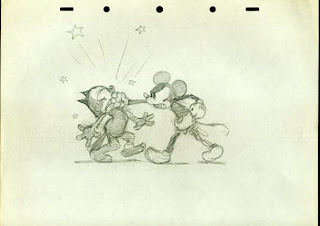 This gag drawing is being sold at the moment by Van Eaton Galleries. A few more elements from the Walt Disney Family Museum. Those are related to Gallery 8. 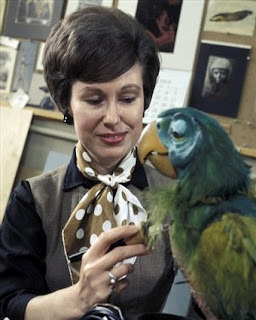 I mentioned a few days ago that 2010 would see the release of a book about Imagineer Harriet Burns, Walt Disney's First Lady of Imagineering, Harriet Burns by Pam Burns-Clair and Don Peri. 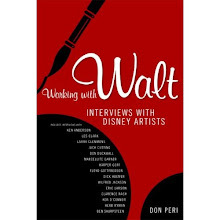 Don was kind enough to answer a few questions about the book. Didier Ghez: Can you run us through the genesis of that project? Don Peri: After Harriet's passing in July 2008 and a memorial service held one month later, Harriet's daughter Pam received such an outpouring of love for her mother from family and friends, both personal and professional, that she decided to gather this material together into a tribute book about her mother. I came on board as a co-author and we solicited and received many more stories about Harriet and they all comprise the book, together with many photos of Harriet that will delight the readers. 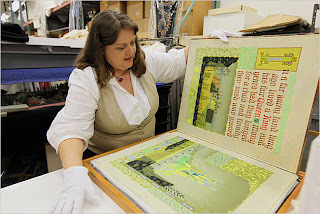 DG: What is the most exciting material you have unearthed for this new book? DP: The range and depth of Harriet's impact on those whose lives she touched whether as a mother, grandmother, relative, mentor, co-worker, or friend. The stories will bring a smile or a tear, or both, to the reader and will contribute to an understanding and appreciation of this tiny woman with a heart as big as her native Texas. DG: What primery sources did you use to write this book? 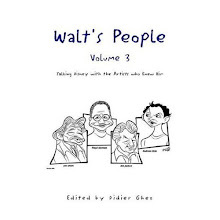 DP: The material for this book comes primarily from contributions made by her family, friends, and colleagues. 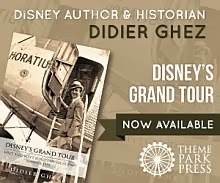 DG: As Disney historians and enthusiasts, can we expect any "revelations" or surprises in this book? DP: One surprise for those who didn't know Harriet well may be her sense of humor. 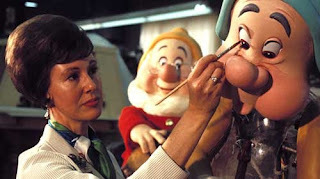 Despite her appearance, which was always flawless, she had a well-rounded sense of humor that could be a bit bawdy at times, perhaps due to her years of being the first woman among an all-male imagineering staff. She could shock people with her humor and she was usually spot-on with her observations. 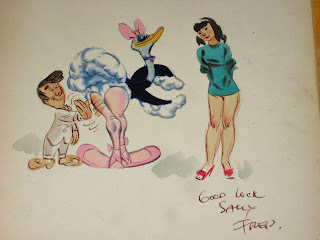 As an example, Disney Legend Rolly Crump recalls "Harriet and Fred Joerger [both Disney Legends] loved to tell jokes that were a bit off color. She loved shocking us with her own personal tales like 'dating' the entire high school football team. We never really knew which stories were true and which were meant for just shock value." DP: The book will most likely not fall into chapters but will be a mix of accounts from her many acquaintances. DG: Any other details you can give us about it? DP: You will learn Harriet's delightful childhood nick name! 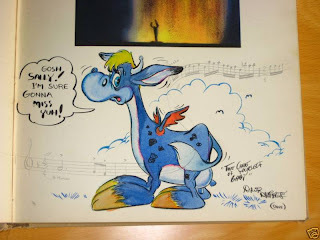 DG: What other Disney-related book projects are you currently working on? 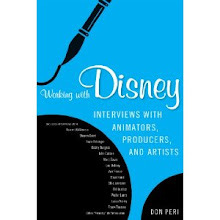 DP: I am currently working on a second volume of interviews with Disney artists who impacted Disney films, television, and theme parks. 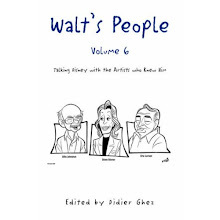 Some of the interviews are with well-known artists and some may be rare or perhaps the only surviving interviews with some lesser known artists. Don't walk, run... towards Amazon to pre-order it or towards your closest bookshop in October to buy it! 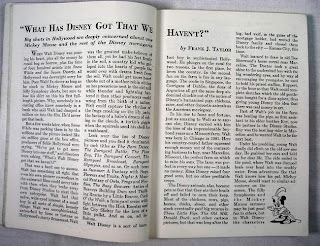 I have just received a review copy of JB Kaufman's new book, South of the Border with Disney: Walt Disney and the Good Neighbor Program 1941-1948. 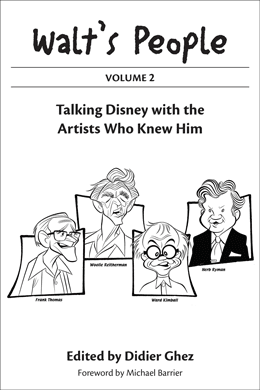 Let's admit it: knowing JB I expected something really good text-wise, something really in-depth, something in which I would learn a lot, something that would fill half a million key gaps in Disney history. I had been looking forward to this book since 2001. Eight long years. So if I said that I could not wait to open the package that contained it, you will not be surprised. What happened next was not expected though: when I started browsing through this new book I simply could not believe my eyes. The text is more complete and more in-depth than literally anything I could have imagined. 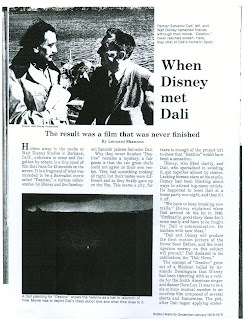 I believe that only four Disney historians are as thorough: Michael Barrier, John Canemaker, Paul F. Anderson and JB Kaufman. So there is even more to learn in the text itself than my wildest dreams built over 8 years had made me expect. How is that for a stunning start? But there is more! The quality of the illustrations is as astounding as the text. At least half of the visual documents are "never seen before." I had goosebumps by looking at almost every single page of this book. 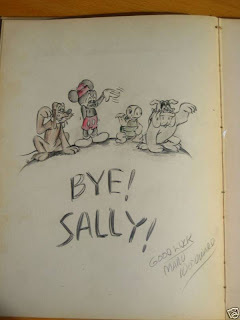 I had started to think that aside from the Canemaker books and The Disney that Never Was by Charles Solomon, we would from now on be offered either great text-books (Working with Walt by Don Peri for example) or great art-books with no text (The Disney Archives Series for example). 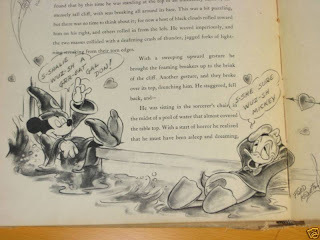 Unfortunately JB's Silly Symphony book had not dispelled this impression (great text with uniteresting visual documents). 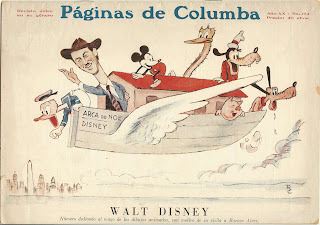 South of the Border with Disney shows that I was wrong: ideal books can exist. 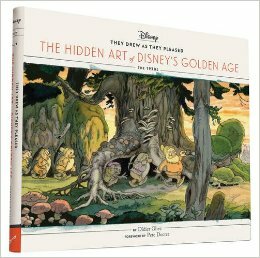 Books about Disney history as we dream them. Books that are as close to perfection as we will ever get. 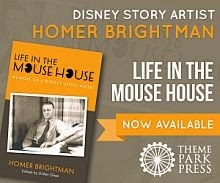 By the way: this is the first book released under the Walt Disney Family Foundation label. What an impressive way to start. Disney history is truly alive and well today. 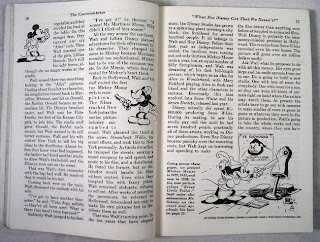 [Much of the recording of Mickey and the Beanstalk was done in 1940. That's why the soundtrack is a mix of really solid Walt Mickey and nascent Jimmy MacDonald Mickey. Pitts was very popular and very famous in this era, her star faded and she is seldom remembered today. 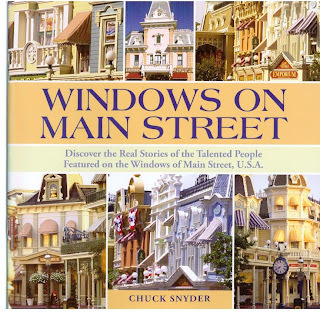 The book Windows on Main Street by Chris Snyder is well written and fun to read. It could really have been a great book. Unfortunately it is much too short (26 light pages). The idea is to explain to park visitors what the names on the windows over Main Street stand for. Chris therefore shows some of the windows with a little profile of some of the Imagineers and executives that they feature. This is very nice for a first or second time park visitor, not nearly enough for real Disney enthusiasts or Disney historians. 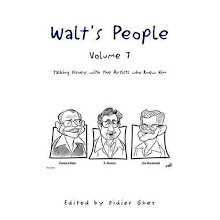 There is one great aspect of the book that in itself makes it worth owning though: it contain at the end four pages listing all the names of all the individuals featured on the windows (with their locations). This is a great reference and I am really thankful for it. So this is not a "must have," but if you go through the parks (yes, it's a park exclusive) it might be worth picking it up. 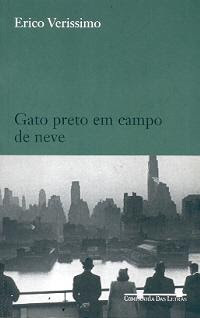 I just finished reading the book Gato Preto Em Campo de Neve by the Brazilian author Erico Verissimo. Erico Verissimo, who I often think is the Brazilian counterpart of John Steinbeck, visited the US for the first time in the late 1940 and early 1941 on a good will tour and tells of his trip in this book (which is far from being his masterpiece). 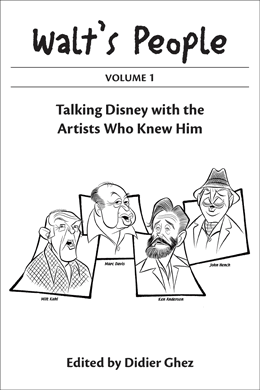 There is a whole chapter about his visit of the Disney Studio in which he tells of a meeting with actress ZaSu Pitts. 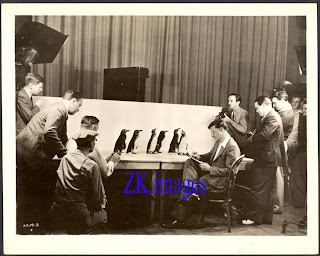 Verissimo asks John Rose who seemed to be the Head of Publicity at the time what Pitts is doing at the Studio after seeing her record some dialogue and is being told that she is the voice of a harp. A harp in early 1941 (around April or May)? This sounds like a recording for the voice of the singing harp in Mickey and the Beanstalk. 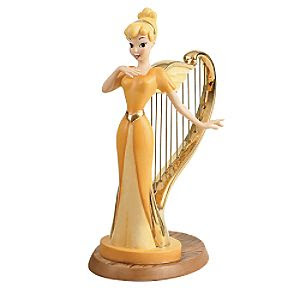 But that featurette was only released in 1947 as part of Fun and Fancy Free with Anita Gordon as the voice of the singing harp. That being said we know that Disney was already working on this project before the war. What I did not realize is that the project had gone beyond storyboard phase. 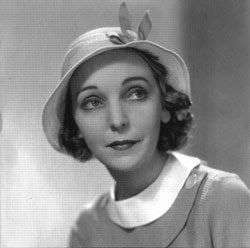 By the way, on another note, ZaSu Pitts appears as a caricature in the Disney short Broken Toys.